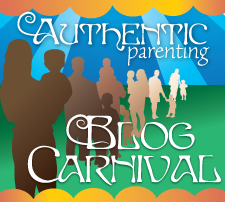 Welcome to the May edition of the Authentic Parenting Blog Carnival, hosted by Authentic Parenting and Mudpiemama. This month’s topic is “Parenting Practices and Criticism”. Please scroll down to the end of this post to find a list of links to the entries of the other participants. Enjoy! When I became a parent, I realized that parenting and perfectionism are like oil and water, they just don’t mix. I also realized that parenting choices and criticism were like magnets, somehow always attracting each other. It doesn’t matter how hard one tries to be the perfect parent, there are too many circumstances, to many variables, suggestions, ideas, possibilities, expert and not so expert opinions, guides and books out there that may challenge or criticize whatever choice you may make. Parenting has been an excellent rehab exercise for overcoming perfectionism and handling criticism. Over time I have learned to deal with the pressure I put on myself and the pressure I imagine from others to be perfect. It’s not that other people’s opinions, ideas and challenges can’t or don’t matter. They can and sometimes do. Encouraging words from even total strangers and finding like minded parents is great. Criticism, opposing views, suggestions, all have the potential to be opportunities for reflection, a chance to fix mistakes, re-align our thoughts. Other times however, it’s just the sock police and well…you just can’t bother about the sock police! Who is the sock police? When my second child was about a year and half old, he decided socks were not something he would actually be wearing. To get to his socks, he had to take off his shoes, and so, it was not uncommon to spot him with no socks and no shoes at various times of the day and really any place. This was, I learned rather quickly, according to all the elderly ladies in our village, a horrible, terrible, no good thing to allow my child to do. I was told, admonished and counseled so often on the sock issue that I dubbed the elderly ladies “the sock police”. They were so sure that their way was the right way. Maybe it was…for them. For my toddler with hot, hot feet, not so much! It may be our choices regarding sleep, feeding, comforting or discipline that bring about some kind of “sock police” around. It may be our families or friends just don’t understand the choices we make because they are so different from their own. Those choices or other people’s reactions to our choices may make us question ourselves, but that is really ok. By questioning myself I usually either affirm my choices or seek the information to make a new, better, more researched, more fitting choice. In the end though, I will never be the perfect parent, I will never please all the different parenting choice patrols and I am cool with that. Wait, I’m not just cool with that. I don’t want to be perfect! I know that daily I am modeling life choices to my children and I don’t want them to grow up thinking they have to be perfect. I would rather they learn how to deal with inevitable imperfection instead. I want them to have the fortitude to be themselves and the courage to be make mistakes. If they hear someone criticize me, they can see me smile and hear me say, “Thanks for telling me that” then we can talk about it, and hopefully they will learn that sometimes others will have something not so nice to say about us but it doesn’t have to bring us down, and we can learn to respect differing opinions too. I want my children to see that we are diverse, fallible creatures that can reflect, learn and grow. So there, I don’t want us to be perfect and if people have a need to point out our flaws and “bad” choices so be it! I am not the perfect parent, my kids are not perfect kids…this isn’t to say that I don’t find my kids awesome, because of course I do. Have you had a run in with the sock police? What about another kind of parenting choice patrol? How do you handle it? BEWARE of Sanctimommy — Amanda at Blinded by the Light talks about how recognizing your own inner-sanctimommy and how it will facilitate ways to deal with other criticism in your life. We’re on the same team — Brittany from The Pistachio Project shares about how we should support and respect each other because we already get enough criticism from the outside world. 30 Responses To Parenting Criticisms — Jennifer at Hybrid Rasta Mama shares 30 ways in which you can respond to parenting criticisms. A Case for the Dramatic — A smart-alec response to a stranger’s view by Jennifer from True Confessions of a Real Mommy. I Could Never… — Mandy at Living Peacefully with Children discusses how the phrase “I could never” really means “I would never want to” and how owning our words and actions can lead to understanding and empathy. Admiration For A Parent’s Strength— Jennifer at Our Muddy Boots shares her admiration for parents who continue to make parenting choices in the best interest of their child even when those closest to them disagree. Assumption Free Zone — Paige @ Baby Dust Diaries challenges us to cultivate kindness for everyone; even if you disagree with them. Perfection, Criticism, Parenting and The Sock Police — Ariadne @ The Positive Parenting Connection is sharing how parenting has been an excercise in overcoming perfectionism and handling criticism. Silencing the Voices In My Head — At Authentic Parenting, Laura writes about fighting her inner critic. Tackled from the Sidelines — Marisa from Deliberate Parenting reveals what parenting choices she makes that are most often questioned and how she is coming peacefully to the defense of her decisions. Different Strokes — Justine from The Lone Home Ranger shares the method she uses to explain her family’s “crunchy” differences to her preschooler. [WORDPRESS HASHCASH] The comment’s server IP (72.232.7.15) doesn’t match the comment’s URL host IP (72.233.69.6) and so is spam. [WORDPRESS HASHCASH] The comment’s server IP (66.96.128.72) doesn’t match the comment’s URL host IP (66.96.160.157) and so is spam. thanks for stopping by and sharing your story too! This happened to me several times, not as a parent but when I was an infant/toddler teacher. I wonder if there is some connection for people of older generations between being fully clothed and good care. On several occasions, I have had ladies comment on whether children should be wearing sweaters, shoes, etc. I like the idea of modeling how to handle criticisms on the spot as a way to show respect for differing opinions. I hope to be able to do this if I face this kind of situation again.